Are you leading the life you were meant to lead? Is it too late to change course? The simple truth is, it is not too late – for any of us. Even if outer circumstances cannot be altered. About the Book What is unlived life? 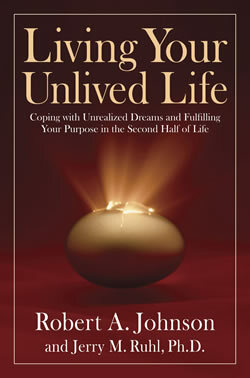 Living Your Unlived Life: Coping with Unrealized Dreams and Fulfilling Your Purpose in the Second Half of Life explores the essential developmental task for achieving true maturity—rectifying the loss of abandoned dreams and unrealized potentials to achieve our full potential. Available now from Tarcher/ Penguin, this new book by renowned therapist Robert A. Johnson and his long-time collaborator and fellow Jungian psychologist Jerry M. Ruhl, Ph.D., is aimed at helping people find validation and satisfaction as they age. It is a profound and important guide to the psychological tasks of our mature years when we are beckoned to grow beyond the requirements of family and society, to navigate transitions, and to secure our own relationship to wholeness. Writing with elegant simplicity, Johnson and Ruhl help us understand our own heritage of unrealized hopes—and how they must be examined and transformed if we are to be at peace with ourselves and others in middle-age and beyond. Living Your Unlived Life explains that, when brought to awareness, our unlived dreams can propel us beyond our disappointments — even if outer circumstances cannot always be visibly altered. The book is a deeply realistic blueprint for transforming regret into greater consciousness and integrating the hidden parts of our psyches into our outer lives. revitalize a connection with God and spirit and attain peace in purpose in our mature years. It includes all those essential aspects of you that have not adequately integrated into your life – conscious or unconscious. You can hear the distant drumbeat of unlived life in the mutterings that go on in the back of your head. “Woulda-coulda-shoulda.” Or in second-guessing life choices. Or those late night longings. The unexpected grief that arises seemingly out of nowhere. A sense that you have somehow missed the mark, or failed to do something you were so sure you were supposed to do. Where did we go wrong, and what is this life that we find ourselves living, so different that what we set out to do? We all carry a vast inventory of abandoned, unrealized, or underdeveloped talents. These do not just “go away” through disuse or by ignoring them, believing they are part of a childish fantasy or daydream. Instead they go underground and become troublesome—sometimes tormenting—as we age. When we find ourselves in a midlife depression, suddenly hate our spouse, our jobs, our lives – we can be sure that the unlived life is seeking our attention. When we feel restless, bored, or empty despite an outer life filled with riches, the unlived life is asking for us to engage. To not do this work will leave us depleted and despondent, with a nagging sense of failure or ennui. If you have ever yearned for a fate different from the one you have, Living Your Unlived Life is a revealing account of how to turn regret and disappointment into greater consciousness. An instructive roadmap, it penetrates the surface of modern life, providing simple tools that produce profound results, moving our understanding of the inner realm to new depths. The book includes wisdom that spans many cultures, continents and traditions – from ancient Greek myths to Hindu and Zen sages to Christian mystics to contemporary poets, artists, and scientists. The authors’ many years of teaching workshops, lecturing on this subject, and guiding individuals through their inner work are evident in the rich diversity of relevant personal stories used to illustrate key concepts. Living Your Unlived Life received a starred review from Publisher’s Weekly, and was one of five recent featured “Books for Grownups” in AARP: The Magazine.